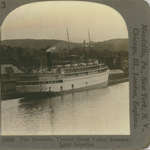 Stereoview of the Great Lakes Transit Corporation steamboat TIONESTA in port on Lake Superior. In the background is the Cohodas Brothers warehouse. To the left is a railroad boxcar. 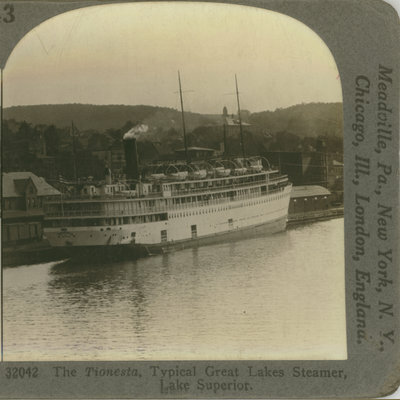 "32042 The Tionesta, Typical Great Lakes Steamer, Lake Superior"
"Keystone View Company Cpyrighted Manufacturers Publishers Made in U.S.A."
"Meadville, Pa., New York, N. Y., Chicago, Ill., London, England"